Free Exercise Time for Canines and Humans! FETCH! is an organization dedicated to providing dog guardians of Island County with areas where they are free to exercise their canine friends off-leash without disturbing others. FETCH! is supported by its members, donations from friends, and volunteers. Join today and become a member of the FETCH! family! FETCH!, in partnership with the Island County Parks Department, helps maintain three off-leash parks on Whidbey Island: Double Bluff Beach, Marguerite Brons Memorial Park, and Patmore Pit. For information and directions to the various parks, just click on the map at the right to open a new window with a Google map of the parks. You can learn more about our organization and it's history, and how you can become a part of it, at our About FETCH! page. 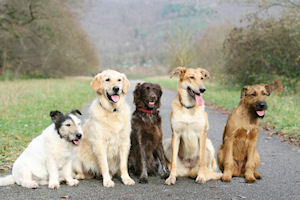 To find out more about the benefits of off-leash parks for dogs, dog guardians, and the wider community, see Why Parks? For the latest news about FETCH! and the parks, see Latest News. We've also collected a number of links to local dog-related organizations and businesses on our Cool Links page. For more detailed information about an individual park, just click the button to the left with the park name. It's easy to donate to FETCH! Just click the Donate button at the bottom left side of any page to find out about the 3 easy ways to help FETCH!, a 501(c)3 non-profit organization, with your tax deductible contribution. We look forward to seeing you at the parks! Double Bluff Web Cam and Tide Chart!